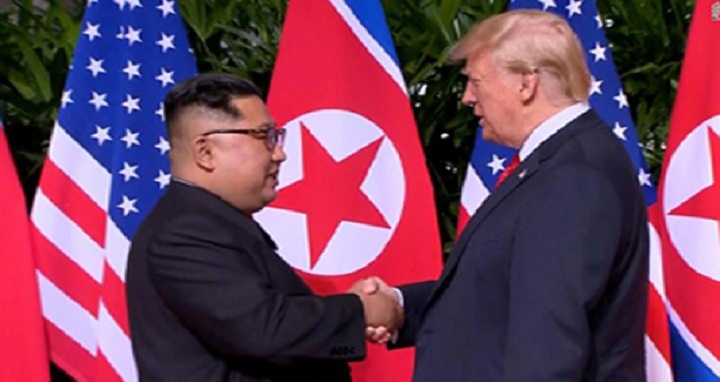 Dhaka, 12 June, Abnews: President Donald Trump put his extraordinary gamble with North Korea's Kim Jong Un to the test on Tuesday, sitting for unprecedented and surreal talks with the rogue kingdom's despotic leader in what he hopes will amount to a historic breakthrough. Later, Trump said his historic summit with Kim was going "very, very good" and predicted an eventual agreement on Pyongyang's nuclear weapons, a gut-level assessment Trump had claimed earlier in the week he would make within the first minutes of the meeting. "Excellent relationship," he said as he emerged from one-on-one talks after 38 minutes. Other developments fueled that impression. Minutes before the historic handshake, Trump tweeted that his top economic adviser Larry Kudlow had suffered a heart attack. Immediately after the encounter, Dennis Rodman -- one of the only Americans to have met Kim -- was openly weeping while being interviewed by CNN's Chris Cuomo. That didn't stopped Trump from heightening anticipation for the summit, which he views as a landmark event that his predecessors could never have accomplished.